The organisers of The Superyacht Cup and the Royal Yacht Squadron have announced plans to hold a Superyacht Cup 2012 regatta in Cowes on the Isle of Wight prior to the start of the 2012 London Olympics. 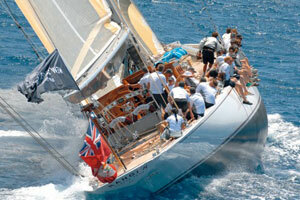 The four-day regatta will take place from 22-25 July 2012 and is open to superyachts over 24m. The Royal Yacht Squadron will be the Organising Authority responsible for providing the race management and course setting for the event. The Superyacht Cup team will manage the overall event including the social programme. The regatta has been carefully planned to immediately precede the Opening Ceremony of the 2012 Olympics in London on 27 July 2009, and the start of the Olympic sailing races in Weymouth on 28 July. The participating yachts may opt after the event to head up the Thames to London for the Opening Ceremony, or alternatively to the sailing venue in Weymouth, where plans are being considered for Superyacht moorings to be made available to visiting yachts. “The summer of 2012 in the UK is going to be the focus of many sporting, cultural and business activities, and with the help of the Royal Yacht Squadron we plan to host a very special event for superyachts from all over the world to join in the Olympic excitement. Cowes and the Solent are a world famous sailing venue and the perfect location for such a prestigious event” commented James Pleasance, SYC Marketing Director. Full details of the racing and social schedule will be announced in due course. In the meantime, owners wishing to register their interest in competing in the 2012 Superyacht Cup are invited to contact the Superyacht Cup office in Palma, Mallorca at 34 971 70 87 95 or by email to info@thesuperyachtcup.com.